Good evening. 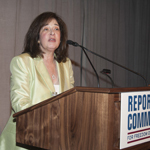 I’m Saundra Torry, chairman of the Reporters Committee. Thank you so much for joining us tonight and for your support of our work on behalf of freedom of the press. The Reporters Committee has come full circle since its founding in 1970. Back then, a small group of reporters banded together after the Nixon Justice Department demanded that a number of reporters turn over their sources. Today, nearly 45 years later, the subpoenas are still coming. And the government has become even more aggressive, secretly seizing reporters phone and e-mail records. Of course, this sort of thing keeps the Reporters Committee busy, and gives me a great organization to chair. But frankly on this score, we’d rather have a lot LESS to do. If the government is listening tonight — and these days, there’s a good chance they are – we want them to know that keeping the confidences of our sources is a cornerstone of the work we do. And it’s something the Reporters Committee, working with you, will continue to defend aggressively. And now I’d like to turn the mike over to Bruce Brown, our executive director, to tell you a little more about our work. As Bruce said, there are a lot of people here tonight who make our work possible. In fact EVERYONE here tonight makes our work possible. So a round of applause for all of you. I want to thank my colleagues at USA TODAY AND GANNETT for giving me the time to do this job and for so generously supporting the Reporters Committee over the years. Some of you are here tonight — Gracia Martore, Larry Kramer, Dave Callaway, Dave Lougee and Barbara Wall. We really appreciate it. And most of all to our dynamic duo, Don Baer and Don Graham, or as we call them, the two Dons. They have been the most gracious, most generous, most hard-working co-chairs any organization could hope for — and they’ve taken us into record fundraising territory tonight. I would like to introduce the chairman and CEO of Burson Marsteller, and one of our heroes tonight, Don Baer.